This dish chair is made out of soft cotton (filling), polyester cotton (front outside layer) and 600D oxford polyester (back outside layer) with PE coating for more comfort. It has a strong 16/19mm steel tube bracket structure design with powder coated legs. This oversized saucer chair is so easy to use that it can be folded within seconds. Open the chair, sit in it and the safety-latch locks automatically. To fold the chair you have to press the safety-latch under the chair and help the construction to move and fold. EASY SET-UP: This saucer chair is so easy to use that it can be folded within 5 seconds. Open the chair, sit in it and the safety-latch locks automatically. HEAVY DUTY AND SUITABLE: The dimensions of this dish chair is 34x23.6x17 inches and is suitable for people up to 6.2 feet tall. It can support up to 225lbs. COMFORTABLE AND DURABLE: This folding saucer chair is made out of soft cotton (filling), polyester cotton (front outside layer) and 600D oxford polyester (back outside layer) with PE coating for more comfort. This deluxe camping chair has a strong 16/19mm steel tube bracket structure design with powder coated legs. 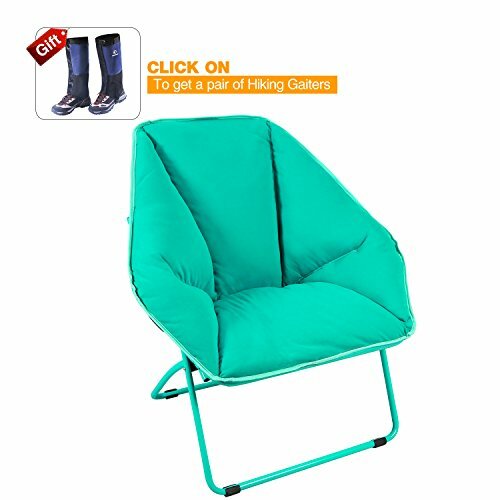 MULTI PURPOSE: Enjoy this dish chair for in-and outdoor activities such as camping, picnicking, events, at the office, in your house or anywhere else you want to sit comfortably. GET THIS COMFORT DELUXE CAMPING CHAIR RISK FREE: Your 100% satisfaction has always been our top priority. That is why all of our products are backed by our unconditional 365-day manufacturer warranty.